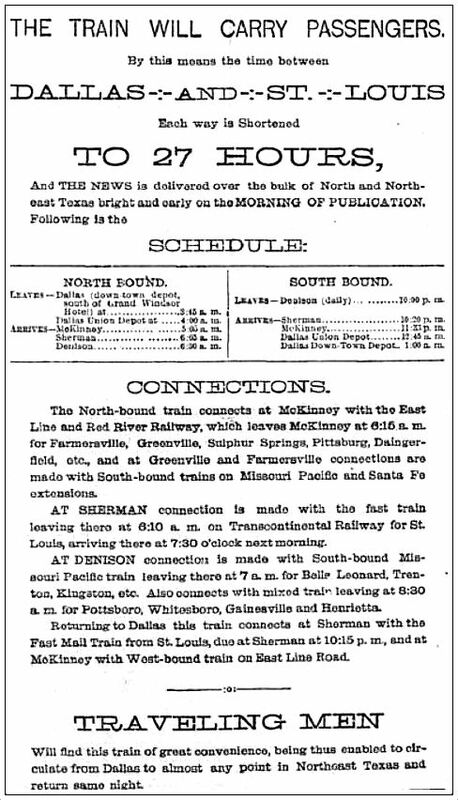 A year and a half later, The News one-upped itself and made the announcement that it would operate a special train to Denison — again, “at a vast expense.” This train would transport editions of the paper in the wee small hours in order to assure that The Dallas Morning News would actually BE a morning newspaper for as many of its subscribers as possible, whether they lived “within a block of the press” or a hundred miles away (DMN, Sept. 30, 1888). News-hungry Denisonians could read their papers over breakfast at the same time their Dallas counterparts did. The train was dubbed by some “The Comet” (not to be confused with the MKT’s later Katy Komet). 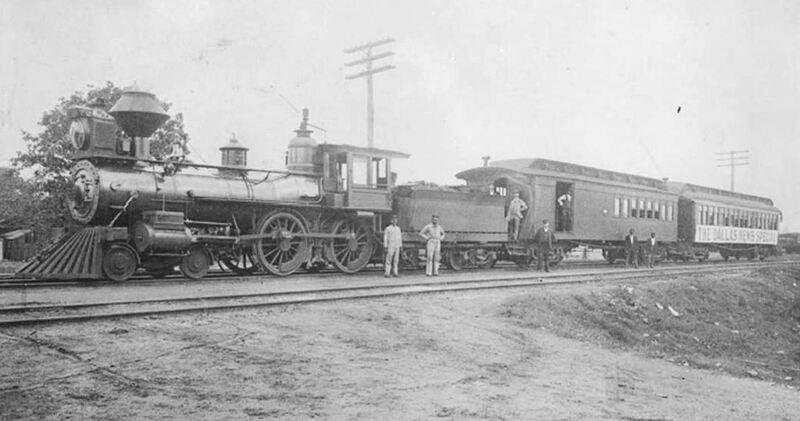 It was a “fast train” that carried passengers as well as newspapers along the Houston and Texas Central rails. A rousing account of the first Dallas-to-Denison run appeared in the pages of both The Dallas News and The Galveston News (which often shared content). A link to that full story is below, but here are a few passages from an article written the next year, touting the wondrous success of the News Special, written as only a nineteenth-century newspaperman could write it (and the writer might well have been G. B. Dealey himself). First, one encounters a mention of Plano in a more grandiose combination of words than one might expect, as the writer describes his pleasant pre-dawn train trip along the route. Plano was reached before the drowsy god of day had wiped his eyes at the first yawn. He rolled over in his couch by the time it reached McKinney, and he was sitting on the side of it when the train was at Melissa. And here the mocking birds, with no ruddier iris upon their breast, but moved with the spirit that makes the burnished dove mourn out his love, made the air resonant with their chatter and their songs. Into Sherman and Denison the train plunged and the trip was done. Um, yes. Then he breaks it down in a little more specifically. Actually a LOT more specifically. It starts. Two minutes are consumed at the Missouri Pacific crossing five miles out, two minutes at Caruth’s, five minutes for water, two minutes at Richardson, two minutes at the Cotton Belt crossing, three minutes at Plano, two minutes at Allen, three minutes at McKinney, two minutes at Melissa, fifteen minutes at Anna for a meeting point, three minutes at Van Alstyne, two minutes at Howe, five minutes at Sherman. Total forty-eight minutes. The distance between Sherman and Dallas is sixty-four miles. The time card calls for two hours and five minutes from Dallas to that point. Forty-eight minutes is consumed in stoppages. Anyone can make the calculations, sixty-four miles in seventy-seven minutes, and see the terrific speed that this train makes, has made for over a year, and made it without a single accident, and it is a good road — an awful good road — to make it over. Below, a train identified as this H&TC News Special to Denison, even though it looks remarkably similar to the T&P train (in the photo above) which may or may not have been that earlier 1885 mail train to Fort Worth. Dealey is identified as the man in the light-colored suit, standing on the steps (he also resembles the man in the top photo, but now with a full beard). The train would slow down as it neared a small-town depot, and, without stopping, a man would toss bundles of papers from the train into the waiting arms of another man on the platform, who would then divide them up and hand them off to men and boys on horseback who would race to deliver them to stores and homes before breakfast. The Dallas Morning News ran its hot-off-the-presses newspapers up to Denison for several decades on this train until, presumably, cheaper trucks were pulled into action. But did the rather less romantic trucks, rattling up to Grayson County, inspire the mockingbirds to “[make] the air resonant with their chatter and their songs” as had the noble locomotive speeding the news through the night? I think not. Top photo, titled “The Dallas Morning News special train,” is from the Belo Records, DeGolyer Library, Central University Libraries, Southern Methodist University; it can be viewed here. It’s a bit confusing, but this may show the inaugural run of the DMN’s special train to Fort Worth on May 22 ,1885, along the Texas & Pacific Railway. If anyone has suggestions on where this photo may have been taken, please let me know. 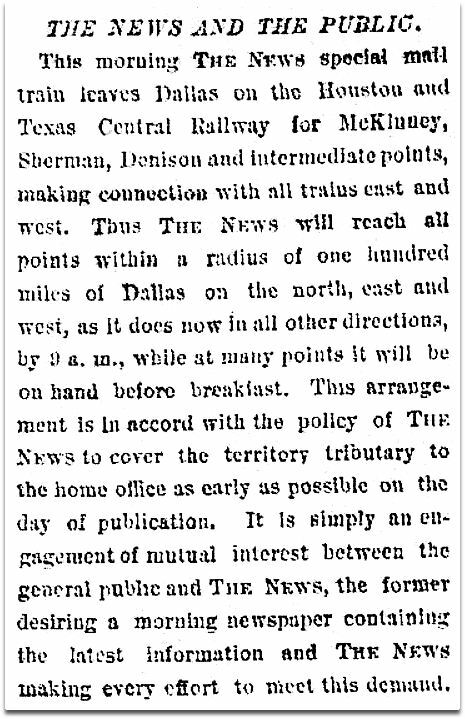 “Special Mail Service, Observations of a Staff Correspondent Along the Route” (DMN, Oct. 27, 1885), describing the new Fort Worth route and how The News convinced (i.e. 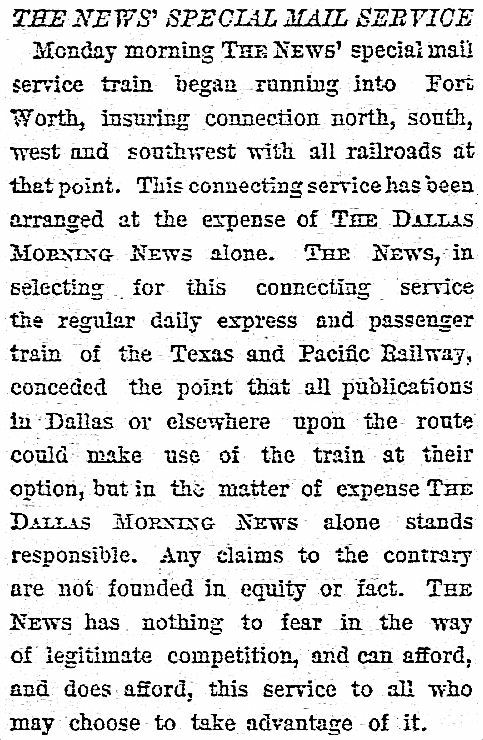 paid) the Texas & Pacific Railway to include a stop in Dallas to load up on newspapers and haul them westward, can be read here. Click photos and clippings to see larger images. MY Dads Family came here due to Railroad and they were good people as the office crew, in the 1900’s, while My Great grand father H.P.Hall was placed in Dallas for the Santa Fe and he retired in 1920….but this bit of history is how Dallas really came to exist……and was a very dynamic era….that had so much opportunity then…freeways replaced rails….and the freeway is really a more expensive problem….Rail was easy up to one company or 300 to get you there in style…good story Paula…. The little gazebo-like structure at the left in the first picture looks like the one that was once on the Pacific Avenue side of the old east Dallas passenger depot.